Cellular Restorative Serum 1oz. RICH IN VITAMINS C, A & E it is FAST ABSORBING (feels like a luxurious moisturiser). LEAVES YOUR SKIN FEELING SMOOTH AND SOFT like a baby’s bottom! REPAIRS & REGENERATES COLLAGEN & renews skin cells. Blended with ingredients known to REDUCE WRINKLES, firm skin, reduce redness, even out skin tone, reduce age spots & repair sun damage. The natural oils in this unique formulation, & known for their moisturising & cell regenerative properties. Rich in vitamins & linoleic acids, they also HELP TO REDUCE LINES WRINKLES AND DISCOLORATION while softening & firming your skin. Other benefits: Repairs sun damage. 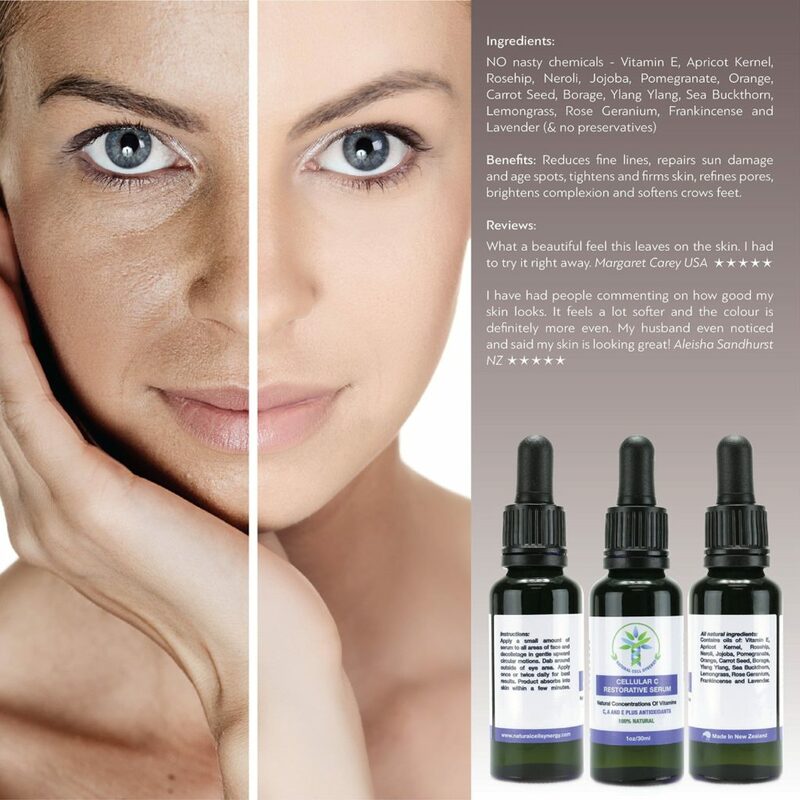 PROMOTING CELL REGENERATION Reduces acne & scarring or red veins. Rich in Gamma Linoleic Acids GLA’s & EFA’s to nourish & moisturise skin Anti-Aging & repairing. Antioxidants scavenge free radicals, enhance skin elasticity, improve skin tone & balance skins PH Vitamins A, C, E & K, target wrinkles & increase elasticity. Aromatherapy BENEFITS FOR EMOTIONAL WELLNESS. Helps reduce skin roughness, length & depth of fine lines & wrinkles. Hand formulated in small batches in the shadow of the Hokonui Hills in Southland, New Zealand.